My other half and I's number one goal at the moment is to buy a house. We are working more than ever and scrimping and saving so that we can save as much money as possible to reach our dream of owning our own home. Now we are realistic about this endeavor. We know that if we stop spending any money at all and save absolutely everything we will hit a burn out and probably end up splurging. So we still give ourselves treats and an allowance each week so that we can still live our lives. 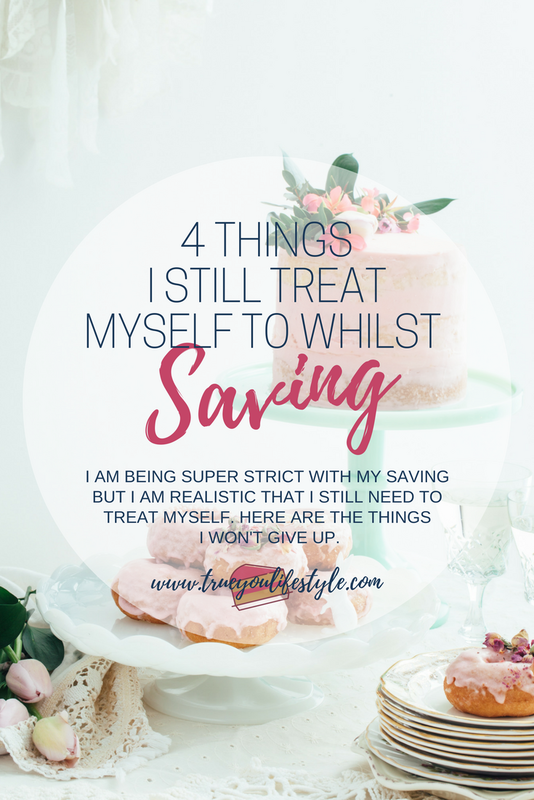 Here are some of the things that we still treat ourselves to whilst saving as much as we can. Traveling is one of my biggest passions. Unfortunately, we are not in the best financial place to be able to travel as much as I would like but definitely once we buy our home and earn more money we are going to do a lot more travel. However, we still have got a bit of traveling in the works for this year too. I think if we did not allow ourselves to travel this year whilst we save we would be so unhappy. I think this would cause me to be demotivated and lose sight of our end goal and just focus on what we have given up instead. So we have three holidays booked. We are going to Northampton, UK for the Easter weekend, this was actually our Christmas present to each other last year. Instead of buying each other a load of useless gifts we would spend it going away and creating memories. This is just a weekend away in our home country so it's not a big splurge at all but will be nice to get away for a bit. We are then going to Cape Verde. This is going to be a nice hot, relaxing holiday which I think we deserve after working so hard and mostly 6 day weeks. It will be all-inclusive so no spending whilst we are there apart from a couple of excursions. We always like to go abroad at least once a year and I really didn't want to miss a year. Plus I got such a good deal when booking this, I booked it through TUI and I also have a TUI credit card (which I pay off in full every month) that earns me points that I can then use as money off with them. Also, if you sign up for Top Cashback you can earn cashback on your holiday, so free money! Read my post here on how to save money shopping online using Top Cashback. Finally, we are going to Woolacombe, UK. Now, this was the biggest saver holiday. If you are not from the UK you might not know that we have a newspaper called The Sun and they provide vouchers to get super cheap caravan holidays. The cost starts at £9.50 it's ridiculous. So we did this and although ours is a little more I think it came to about £40 each for the entire long weekend. We wanted to make the most of the summer in England so thought we would do this. It won't be the most luxurious accommodation but we are willing to make the sacrifice and hope to be outside for most of the time anyway. However, we haven't just spent all our money on this without taking some out of our budget. We have cut down so much on eating out and takeaways. We used to spend so much on food whereas now we have really cut down and try to save it for special occasions such as birthdays or Valentines Day etc. Also anytime I go to spend money on something I don't need I take a step back and decided what is more important, and most of the time travel is more important for me. For my birthday in November last year, my fiancé bought me the most beautiful vase. Now ever since he has got me this I have insisted on getting fresh flowers every two weeks to go in it. I don't want to have to only ever get it out on the odd occasion someone buys me flowers, it would be such a shame to waste it. But I have made a compromise with my budget. I give myself a limit of £5 per bouquet which as long as I am shopping in a supermarket, it's pretty easy. They do some beautiful bouquets and once you get them arranged into your vase they look like they came from a florist. It also means that when my fiance gets me flowers on special occasions straight from the florist it is a little extra special. Plus flowers bring me so much joy, I absolutely love them. I think they look so beautiful and bring life to a room. I think it is definitely worth the small investment for how they make me feel when I see them in my space. I am happy to spend £10 a month for them. So if there is something that just truly brings you joy each time you look at it/experience it, treat yourself. But make sure you are trying to compromise on the price, don't go all out or this habit will be hindering you too much and totally not worth it. We don't scrimp on food. My fiancé and I are big foodies and although we have stopped eating out or buying takeaways we don't watch our pennies when we purchase food from the supermarket. We don't purposely follow recipes that only require inexpensive ingredients or are bland with no expensive add-ons. We just pick what we like and buy it. There are some items that we get the supermarket's own brand like kidney beans, chopped tomatoes or rice etc. However things like Mayonnaise or other sauces, we know what we like and if the taste isn't as nice then we will buy the branded version. We don't quibble about it. So how do we still save so much on our grocery shop? We plan everything. We create a meal plan every week and go to the shop with a strict list which we do not deviate from. You can read my post about Meal Planning here. I also have another post on how we save money at the grocery store without affecting our food quality here. Definitely worth a read if you are a foodie like myself and want to save money without sacrificing delicious food. I never understand when people say that they hate their birthday. I'm like, how can you hate it? It is the one day a year you can unapologetically make about yourself. You can eat all of your favourite food, do your favourite things surrounded by your favourite people. I never work on my birthday and think that we should make the most of it and treat ourselves. Why would you miss out on an excuse to do something fun and out of the ordinary? Make it exciting and stop being a bore on your birthday. Because birthdays are so important to me I always make sure to have something arranged. Same with my fiancé, he isn't too mad about his birthday but I love to treat him and make the day special just for him. So I will book things and go places to make it fun and exciting. For my last birthday, we spent the day in London, went to The Shard (where he proposed!) and watched the Lion King. For his, we are going bubble football with his friends (it's a surprise so shh) and for a nice meal afterward. I am also going to treat him with gifts and bake him an epic cake. Like I said I want to make the most of these days. Birthdays are for feeling special and I am not afraid to part with a bit of cash to make it happen, they only come around once a year and it's just so nice to do something out of the ordinary. Remember if you want to save even more money whilst you treat yourself. Sign up to Top Cashback to get cashback on hundreds of online stores. Sign Up Here. So what are the things you unapologetically treat yourself to?